Even with just a quick glance you can tell that the minifigure for Martian Manhunter is, like most licensed figures, very well detailed and is accurate to the source material. Being an exclusive polybag that only contains a minifigure this set has all unique parts including, to the best of my knowledge, the light blue standard cape. For the time being it looks like this figure and the polybag itself will not be released in any further sets or promotions. Starting with the head Martian Manhunter has some grey shading to depict his famously prominent brow and high cheekbones with some black shadowing to give a deep-set impression to his red eyes. 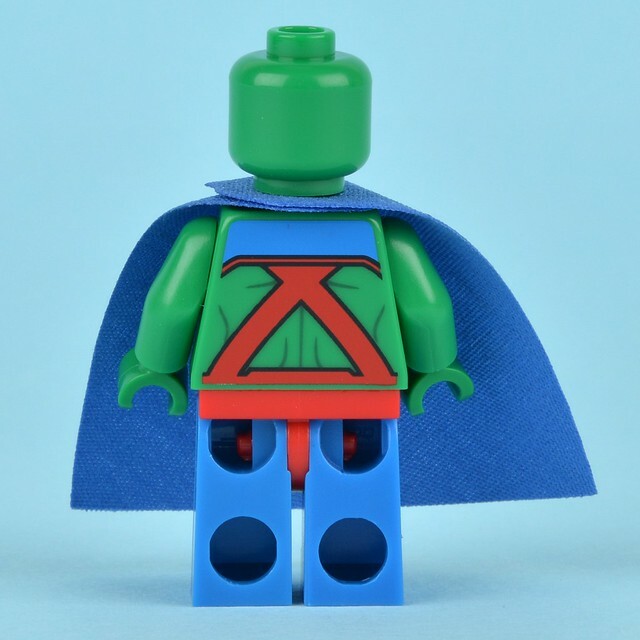 His torso is light green with plain light green arms and hands, the front of his torso is detailed with green to show his muscled chest which is partially covered by two red straps going up from his belt to meet the printed collar of his blue cape with a red on black star symbol laid on the upper middle of his chest. His light blue legs are nicely detailed with red hips and some red and black detailing on the legs to depict his tunic. The only back printing is on the back of the figures torso which has two red straps and and the some blue collar, much like the front. Since this is a one-figure poly-bag, the playability factor relies on other sets. I'm not really a fan of DC myself nor do I know much about all the characters but Martian Manhunter seems to be a popular figure who frequently appears in various DC storylines and he was a common request to be made into a minifigure by lego DC fans. The build of course is simply one standard figure with a cape. Since this set was given away as a free promotional poly-bag and is part of the Super Heroes it has a low/non-existent investment with a high potential for return. Even if you end up buying this set at a relatively low price ($10-15) with intent to resell you could still make about double your investment. Basically unless this set is given away in another promotion (which is unlikely since lego ran out of supply for the poly-bag during the March 2014 promotion) it will go for a high selling point. Super Heroes is one of the most popular themes currently available and is no doubt aided by the recent and ongoing movies and cartoons. This set is in particular is based on the DC New 52 comics version of Martian Manhunter (according to Brickipedia at least) though the character has appeared in several animated shows. Since this set was given away during the March 2014 promotion and the stock of it ran out during the promotion it's safe to say that it is very exclusive set and unless lego decides to make more for another promotion (which seems unlikely) it will probably stay that way. As with most promotional poly-bags this set has good potential, add to that the fact that the figure included is exclusive and you're looking at a high return for a single figure. To get a good understanding of the possible future value of this set we can take a look at the sold Bricklink prices of the four other poly-bags released in the Super Heroes theme that were offered as part of a promotion and have exclusive figures. As you can see in the graph above the two most popular (both in terms of rating and Bricklink price) poly-bags are 30168: Iron Partriot: Gun Mounting System and 5000022: Hulk both of which are under the Marvel subtheme and though that may look bad for Martian Manhunter since he's a DC character he is more likely to perform better than the two other DC poly-bags seeing as he is much more popular character than both Jor-El, who appears to be limited to Superman's background, and the armour suited Lex Luthor who seems to rarely don such armour in any cartoons or movies. The character of Martian Manhunter is about as popular as Iron Patriot but less popular than Hulk but since the Martian Manhunter poly-bags basically sold-out (something that to my knowledge didn't happen with any of the other poly-bags) I think it's safe to assume that it will probably be more popular than all the other Super Heroes poly-bags released so far. From the information above I would say that a year from now a sealed 5002126 Martian Manhunter will probably fetch about CA $30. As far as minifigures go Martian Manhunter makes a pretty good display piece, even though he has no accessories, but he goes especially well with the other members of the Justice League such as Superman, Wonder Woman and Batman. 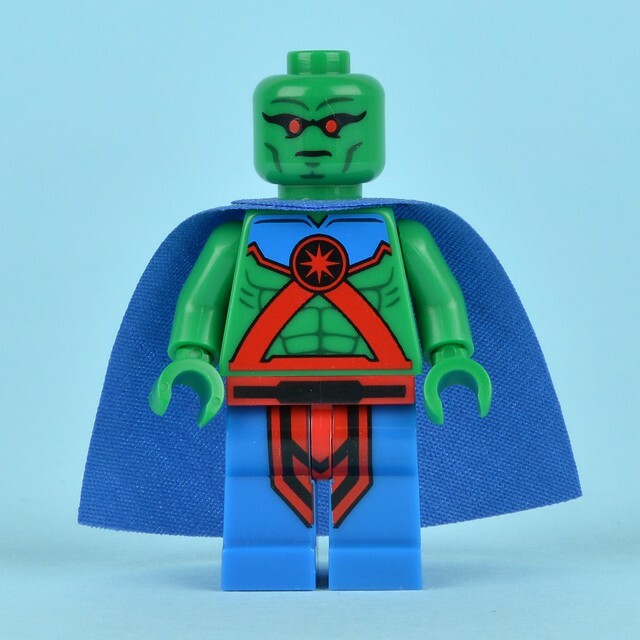 The Martian Manhunter minifigure is of course wll done an will make a good addition to your collection and/or portfolio. If you got this for free as part of the promotion and like the figure I would keep it since it seems unlikely that it will be released in another set any time soon or perhaps ever, if you don't really care for the figureI would wait at least a year before selling so that it can gain some appreciation. If you're looking to buy this figure for your personal collection or to resell now is the time to do it since it's still gaining appreciation on the market and you may be able to get it for a low fee.